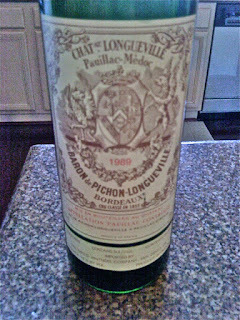 Chateau Longueville au Baron de Pichon-Longueville is the actual title of this wine, but most refer to the wine as "Château Pichon-Baron". It's one of Bordeaux's fourteen "second growth" wines and like most famous Bordeaux Chateaux it has a history that extends back for centuries. The vineyards at Pichon-Baron cover 73 hectares of typical gravel, and are planted with 70% Cabernet Sauvignon, 25% Merlot and 5% Cabernet Franc. The wine is typically aged in French oak barrels for up to 18 months, using 70% new and 30% one-year old, with racking every 3 months. I'd first like to thank a special friend for always being generous and sharing these beautifully aged gems with me. It's great to have the money and/or patience to be able to partake in wine experiences like these, but if your lucky enough to have generous friends like I am, then it borders on sublime! The 1989 Pichon-Baron is still very deep in color and displays only slight discoloration or brick-like hues towards the edges of the glass. The bouquet can be characterized by gorgeous aromas of cherry, leather, chocolate, cocoa powder, and slight nutty-cashew nuances. It's quite typical of an aged Bordeaux showing great complexity and intense, chameleon-like aromas.